PRINTING COMPANY ADMITS DELIBERATELY DESTROYING ABU GHRAIB IMAGES PRIOR TO EXHIBITION. SAN FRANCISCO -- October 19th, 2004 -- Hundreds of art enthusiasts attending the recent opening of South African born artist, Clinton Fein’s, latest exhibition were greeted with a revised exhibition after Palo Alto-based printing company, Zazzle, destroyed two of Fein’s giant images. Fein learned of the last minute decision after a company representative informed him that two of his images had been deemed inappropriate, and Zazzle did not want to be associated with the images. The abrupt decision by the printing company altered the presentation of the exhibition and damaged the integrity of editions already released by the company. The one image, recently reviewed at Chelsea’s Axis Gallery by New York Times’ Ken Johnson, who described it as “an American flag with the stars and stripes made from the text of the official Abu Ghraib report is accompanied by fifty representations of the iconic image of a hooded man teetering on a box with wires trailing from his arms comprising the stars. 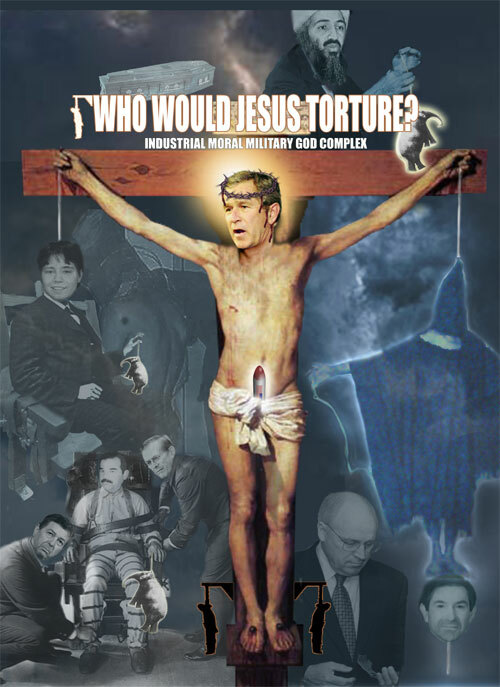 The second image depicting President Bush on a crucifix entitled “Who Would Jesus Torture?” was also withheld by the printing company. Company spokesperson, Matt Wilsey, claimed the image might “offend Christians,” and threatened to sue Fein for defamation after Fein warned he would publicly criticize the company’s actions. Clinton Fein is a prominent First Amendment advocate successfully fought former Attorney General, Janet Reno, in a challenge to the Communications Decency Act (CDA) that was heard before the United States Supreme Court. The Palo Alto based company publicizes among its associates, ironically, The Hoover Institution on War, Revolution and Peace which defines itself as a “prominent contributor to the world marketplace of ideas defining a free society,” and The Bancroft Library at the University of California, Berkeley. The company claimed Fein’s Abu Ghraib flag represented “excessive violence,” although the image would not have been visible or available through Zazzle. Although Zazzle does hawk a reproduction of a Library of Congress photograph of the hanging hooded bodies of the four conspirators who assassinated Abraham Lincoln, and other violent war imagery, Fein had not granted the company permission to use or display his images, attach their name to his work, nor release any information relating to the content of the work or his relationship with the company. In subsequent media reports, Wilsey cited a licensee relationship with Disney and acknowledged that the company had first printed the work before they destroyed it. Included in the repertoire of the entertainment conglomerate are films 'Dogma' and 'Priest', both of which have drawn the ire of Catholics ranging from protests to boycotts. The Walt Disney Company has yet to comment on the destruction of art by its licensees. "I don’t know what kind of statement such business practices make about academic freedom and thought in a democracy, but when a company associates itself with major brands and institutions it needs to be very careful about the corporate image they present and the consistency of the positions they take," stated Fein, who is still weighing his legal options. “This is the wrong fight to pick, with the wrong person, at the wrong time. I'd be interested to know exactly how this printer 'destroys' art." Clinton Fein's exhibition, Numb and Number, opens at Toomey Tourell Gallery at 49 Geary Street on Thursday, October 7, 2004 at 5.30pm. Annoy.com has been involved in public controversies in the past, and has been a strong First Amendment advocate, having fought censorship before the Supreme Court in ApolloMedia v. Reno, and before the U.S. Court of Appeals for the Fifth Circuit in United States v. ApolloMedia. Publicly launched in 1997, Annoy.com is devoted to free speech and the free exchange of ideas. Annoy.com allows visitors to participate in online discussions on topics of social and political interest such as gun control, abortion, health care, the military, the environment, censorship and privacy. The Web site also allows visitors to send anonymous or pseudonymous electronic postcards, related to the discussion topics, to public figures or to persons of the sender's choice.